Action-camera company GoPro Inc. (Nasdaq: GPRO) released more information about its upcoming IPO on Wednesday, saying the company plans to raise up to $427.2 million in the deal. That would give the company a valuation of approximately $3 billion. In today's regulatory filing, the company said that an IPO price range of $21 to $24 per share has been set. GoPro will be offering 17.8 million Class A shares through the IPO. 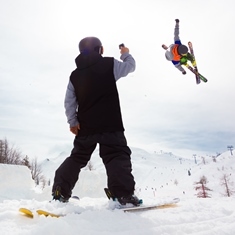 GoPro designs wearable cameras that are frequently used to film extreme sports. Based in San Mateo, Calif., GoPro was founded in 2004 by surfer and now-billionaire Nick Woodman. The company plans to list on the Nasdaq under the ticker "GPRO." Company officials stated that proceeds from the IPO will be used to repay debt and for investment purposes. JPMorgan Chase & Co. (NYSE: JPM), Citigroup Inc. (NYSE: C), and Barclays Plc (NYSE ADR: BCS) are serving as the lead underwriters on the deal. GoPro originally filed for its IPO confidentially in February. The U.S. Securities and Exchange Committee allows companies with less than $1 billion in annual sales to file for an IPO without disclosing all of its financial information. In May, the company filed publicly and announced that it had booked nearly $986 million in revenue during 2013. At the time, Woodman stated that GoPro had doubled revenue every single year since the company began selling cameras in 2004. Woodman's claim wasn't far off. In 2012, the company brought in around $500 million in sales. And GoPro is on pace to top the $1 billion mark this year after posting $236 million in the first quarter of this year.